In today’s fast-paced, competitive society, looks are of paramount importance.The “Mini Lift”, also referred to as a Mini Facelift, is an alternative to the traditional, more formal face and neck lift procedure. Some patients, however, do not necessarily need or want a formal face and/or neck lift procedure. In addition, some patients do not wish to undergo a deep anesthetic. The “Mini Lift” is an office-based procedure done under local anesthesia that is an alternative answer for these patients still seeking a more youthful look. 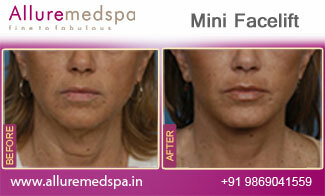 Minimal-incision facial surgery (mini face lift) can make your face look as young as you feel. 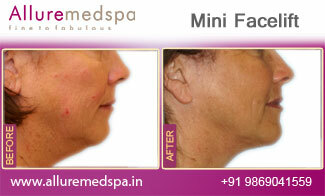 Mini facelift is a cost-saving procedure compared to a full or complete facelift. Also the recovery time from a mini facelift, is relatively shorter than a full facelift to the extent that some people even call it a next-day lift. Depending on what part of the face that is out of balance due to excessive fat deposits or other causes, sometimes most patients need only a mini facelift and not the entire facelift to achieve their desired looks. 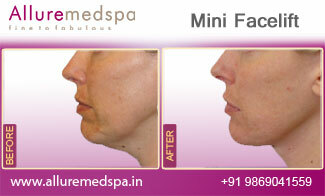 The “Mini Lift” can rejuvenate the lower face and upper neck to provide a more youthful and rested appearance. The best candidates include healthy men and women who are bothered by sagging, loose skin along the lower face and upper neck and sometimes unwanted jowling along the jawline. During your scar less eyelift surgery- endoscopic eye lift, our elite Board Certified cosmetic surgeon will use extremely safe advanced Blepharoplasty technology and equipment to remove excess skin from your upper eyelids. Your surgeon will also lift your eyelids so that your eyes appear larger and more awake. Dr. Milan Doshi is a Cosmetic surgeon who is highly specialized in facial surgery procedures and he is the Member of American Society of Plastic Surgeons (ASPS). He takes an extraordinarily detailed approach to each procedure, and believes there is no such thing as a standard facelift. Instead, he customizes every facial surgery to the needs of the patient. The “Mini Lift” is an office-based procedure done under local anesthesia. By avoiding anesthesia, swelling and bruising is significantly reduced. Patients are able to go home shortly after the procedure with a light bandage wrap. There is generally little discomfort than pain associated with the mini facelift and this is well-controlled with low-dose prescription medication. Sutures are removed within five to six days, at which time a lighter, removable bandage is applied. Patients are usually able to return to work within five to ten days, and often sooner for patients not bothered by the bandages. It's important to limit your activities for some days. Allure MedSpa which is renowned for its state-of-the-art internationally acclaimed services, offers affordable and cost effective cosmetic procedures. To know more about the cost of your procedure request a consult by filling the form below. Your consultation is your chance to ask questions about Mini Facelift and put your mind at rest. Your surgeon will be able to offer you full explanations and answers to all of your queries. You should be able to go out in public with the help of makeup within a few days, but this will vary with each patient. It's important to limit your activities for some days. Bruising and swelling are fairly limited to the first few days following the procedure. There is generally more discomfort than pain associated with the mini facelift and this is well-controlled with low-dose prescription medication. There may be decreased sensation of the face for a month or so with a gradual return to normal. Following Mini Face Lift, the aging process continues and the skin loses more of its elastic properties. However, on the average it may take 10-15 years before you might need any additional tuck up. What’s the Difference Between a Mini Facelift and a Facelift? A full facelift is most often performed on adult patients and is often accompanied by liposuction to remove excess fat from the face and neck while also tightening sagging skin. Target only specific areas, like the brows, cheeks, jaw, neck, etc. Recovery time for a full facelift is usually around one to two weeks, while mini facelift recovery is just a few days due to smaller incisions.